Aphids: Aphid populations are about the same level as seen the previous week. Scattered Lannate applications that are included in the rotation for SWD, should help minimize aphid populations. Blueberry Maggot (BBM): Trap captures remain similar to last week’s levels, and are very low. Most traps are registering “0” adults per trap. This insect should continue to be controlled with the SWD materials already being applied. Oriental Beetle (OB): Oriental beetle adult trap captures increased again this week. OB trap captures are the highest we have ever recorded in the program. This indicates that field populations are also high, and may produce significant feeding damage during the coming months. See the last newsletter for treatment options. Sharpnosed Leafhopper (SNLH): SNLH nymphs have started to mature into the more motile adults. The first adults were seen on yellow sticky traps this past week in both Atlantic and Burlington Counties. SNLH has 2 generations per year. Since the adults have wings, they are more motile, and can easily move back and forth while feeding on Stunt disease infected plants and non-infected plants, thus transmitting and spreading the disease. The materials being used to control SWD will control or suppress SNLH. However, the best materials for SNLH are the same materials used for aphid control – Assail, Actara and Admire. Special applications are not needed for this 1st generation of adults, which will continue for the next several weeks through late July. A second generation will mature in late August and September, after SWD sprays are done. This will be the time to specifically target 2nd generation adults. We will have more on this timing during late summer. Putnam Scale: Scale crawlers were seen over the past week in several locations. Levels are very low and sporadic. Putnam scale has 2 generations per year, the first of which is rarely treated, simply because it occurs during harvest. If you have scale, it should be treated during the 2nd generation crawler emergence, and only in those fields that have it. Scale is an insect that can be present in very low numbers and be hardly noticeable until the following year when numbers can dramatically increase, causing fruit loss and decreased bush vigor. Look at your reject berries for tiny gray spots on the fruit. Those will be the newly settled scales, and indicate which fields have scale populations to be treated in August with either Esteem or Diazinon. Tufted Apple Budmoth (TABM): The timing for all insecticide applications is now over throughout the state. TABM is not a pest to be controlled until the second flight. This would occur in late July and the first half of August, if the inset is a problem. Peach Scab: Scab lesions are starting to appear on younger trees, which did not receive an adequate spray program earlier in the season. There is nothing that can be done at this point for peach scab. What is starting to appear now will be more pronounced over the next couple of weeks. Split Pits and Brown Rot: As in most years, the early varieties are showing a significant amount of pit splitting. Given frequent storms, growers should be off the sulfur only programs and using a rotating combination of good materials. Anything now ripening through mid to late July should be on the improved fungicide program. This means a rotation of DMI Group 3 materials (Indar, Orbit, Orius, Quash) with 7 (Fontelis), 11(Gem), and premix combinations. Please be aware that Quadris Top is a combination that includes the same AI as in Abound, so can be phytotoxic to apples. Inspire Super is a combination of a DMI (Group 3) and the AI in Vangard, and Vangard is not particularly effective for the fruit phase of brown rot. Codling Moth (CM): First brood larvae are present in scattered locations throughout the state. In southern counties, some larvae are mature and have already exited the fruit to pupate. As these mature and start to emerge, the second moth flight should start. The timing of the first spray for second brood control, should commence at 1150 to 1250 degree days after Biofix, depending on the material used. This is predicted to be the first few days of July in Southern counties, using Elk Twp Gloucester County. For those growers checking the Cornell NEWA site, there is a 35 DD difference between Skybit and NEWA calculation as of June 26, with Skybit accumulating the higher number of degree days. Therefore the Skybit calculation is about 36 hours earlier than the timing from NEWA at this location (Elk Twp, NJ). Be prepared to use Delegate, Voliam mixes, Altacor, or Exirel for the second generation. Applications will be due the week of July 4th in southern counties and about 10 days later in northern counties. This is a serious pest, so prepare now. Potato Leafhopper (PLH): PLH adults and nymphs are present and easily seen in southern county apple orchards. 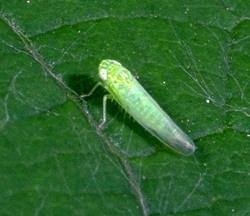 PLH are sometimes accompanied by rose leafhoppers and later, white apple leafhoppers. 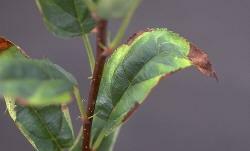 Rose and white apple leafhoppers DO NOT vector fire blight, while PLH do vector fire blight. PLH can b e distinguished by their slight green color, as opposed to white for the other 2 species. PLH will also cause a leaf burn on the leaf margins, often referred to as ‘hopperburn’. We don’t usually worry about the hopperburn, since it is usually minimal. However, since fire blight is present in many orchards, you should tolerate only a very few PLH if fire blight is also present. See PLH adult and leaf burn symptoms in figures 1 and 2. The preferred materials for leafhopper control include Actara, Admire, Assail, Belay, Endigo, and Voliam Flexi. Figure 1. Adult potato leafhopper (Univ KY). Figure 2. Potato leafhopper feeding injury (Univ KY). Green Apple Aphids and Spirea Aphid Complex: Aphid populations have increased slightly in a number of orchards. The treatment threshold is set at 50% of terminals with active aphids present. You really don’t have to treat until you get close to this level. Aphid predators are usually present when aphid populations reach about half this level, unless the orchard is receiving repeated applications of pyrethroid insecticides that will kill most predator populations. The green aphid complex Does Not vector fire blight. Very high populations will affect the vigor of young trees and do need to be controlled if populations are above the treatment threshold. One young orchard in northern counties was seen with aphids on 100% of growing terminals. European Red Mite (ERM): Mite populations have started to build statewide. Treatment levels have been reached in some southern orchards and have been treated. Early reports of Zeal (Valent – IRAC group 10B – etoxazole @ 2-3 oz/A) and Nealta (BASF-IRAC group 25 – cyflumetofen @ 13.7 oz/A) use have been successful. Nealta is not labeled for stone fruit.